The Kyoto Protocol commits industrialized countries to set targets in place that will reduce the amount of greenhouse gas emitted by 5% (on average) over a five year period. This protocol establishes the responsibility of industrialized countries to reduce the amount of greenhouse gases they produce annually because they are directly responsible for the elevated levels of these gases in the atmosphere. Although it is not mandatory, it is considered environmentally responsible to ratify it and those that do not will face consequences with foreign countries. Moreover, the Kyoto Accord advocates that all industrialized countries have a common yet differentiated responsibility. The Kyoto Accord which was developed in Kyoto, Japan was signed on December 11, 1997 and has been in place since February 16, 2005. All countries who are part of the plan must submit an annual review in order to ensure that they are meeting the requirements of the protocol. The admissions of each country must be monitored and records of the findings are to be kept. There is a registry system in place that records each transaction of the countries involved to verify that they are complying with the agreement. Also, there is a compliance system in place that will help countries if they are having trouble meeting expectations. To date, 189 countries have signed and ratified the Kyoto protocol agreeing to do their part in the reduction of GHG emissions including Austria, Belgium, Canada, China, Cuba, Denmark, Egypt, Finland, France, Germany, Greece, Haiti, Iceland, India, Ireland, Israel, Italy, Japan, Mexico, Morocco, Norway, Poland, South Africa, South Korea, Spain, Sweden, Syria, Tunisia, Turkey, Ukraine, United Kingdom, and Vietnam. The purpose of the Kyoto accord is to make all countries accountable for the rise in dangerous greenhouse gas emissions that can potentially damage the environment and leave a lasting effect for future generations to come. Although no country has formally refused the contract, many countries including the United States have not ratified the contract making their participation voluntary and not bound to the details of the contract. Finally, the only country to date that has renounced this contract is Canada (see Canada Formally Withdraws from Kyoto Protocol). 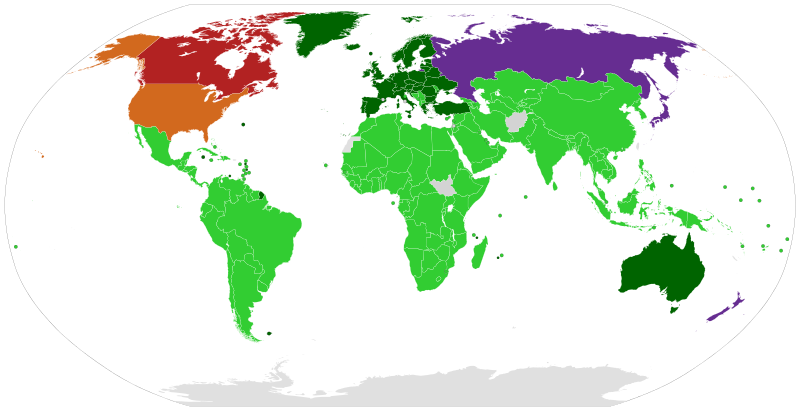 In 2009, it was updated with the Copenhagen Accord which would solve the problems of the previous accord by including more countries, along with starting other initiatives.